On average I build three guitars a year, preferring to build at a comfortable pace, this allows me to focus on each guitar individually and I think results in greater job satisfaction, better sounding instruments and happier customers. 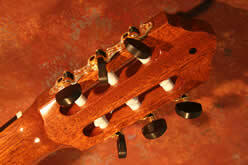 I build 650mm scaled, lattice braced concert guitars with either master grade cedar or Swiss spruce for the tops, bodies in East Indian rosewood, pommel sapeli, ziricote or Australian blackwood and either Fijian or Brazilian mahogany for the necks. 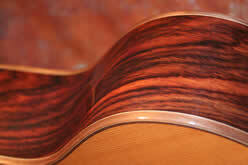 I have a small stock of Brazilian rosewood and I will only use this in guitars sold to a destination that legally accepts CITES listed timbers, the Fijian mahogany is not CITES listed as it is plantation grown, and therefore it is able to be exported legally.Only a small percentage that is cut of the species listed is suitable for luthiery, it is the best of the best, and at the best of times is hard to obtain. I am fortunate to have stocked up earlier, having foreseen a time when what was once available would not be. 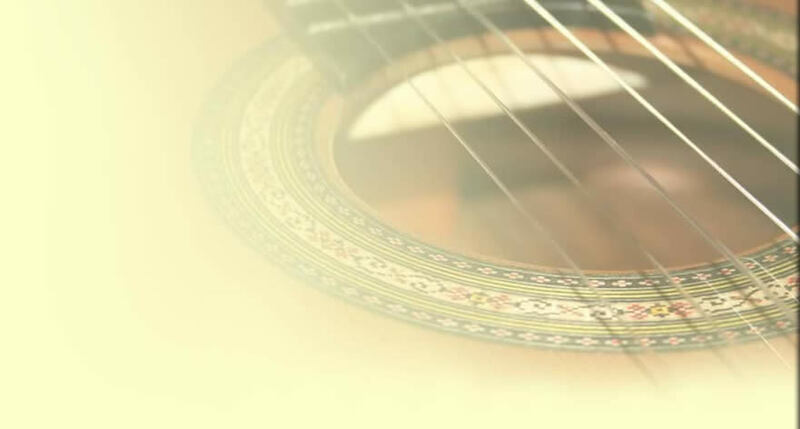 My preference lies in the lattice bracing as I feel that it can be crafted to bring out the desired qualities of fan bracing with the added advantages of the lattice, to form a sound that best suits a true concert classical guitar for the modern era. As the number of guitars grows I'm finding out exactly how efficient and versitile the lattice is, and feel that there is a lot more to learn with this style of bracing. I believe that a solid master grade top will give the very best of all the attributes sought after in the selected species. 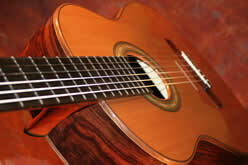 Yielding a guitar with a true natural voice that will open up with years of playing. The finish that is applied to my tops is always as thin as possible, thus reducing the weight that can impede the timbers response to the motion of the strings. 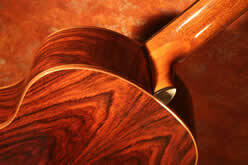 The guitars are now all French polished, with a hard curing, cross linking French polish that has superior wear and heat resistance. 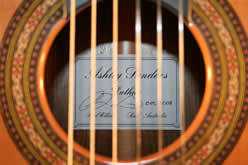 Alessi or Sloane tuners and a Hiscox Pro 11 flight case, Bam cases are available too, are used to compliment the guitars. Of course these can be changed to your own preference.